Embassy protests: Was the embassy statement in Cairo weak or misguided? Was the Statement Issued by the U.S. Embassy in Cairo Weak or Misguided? 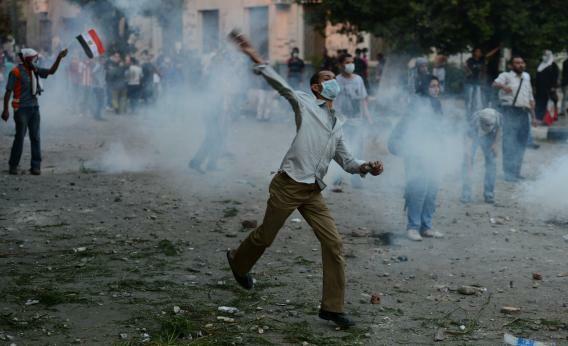 Egyptian protesters throw stones toward riot police during clashes near the U.S. Embassy in Cairo on Sept. 13, 2012. It was not weak. It was not incomplete. It was not inappropriate. It was not misguided. There are plenty of Monday-morning-quarterbacks who can attempt to find fault with the statement. The fact of the matter is, though, the statement was not intended for U.S. audiences, and statements such as the one issued by the U.S. Embassy in Cairo have plenty of precedent, during Obama’s administration, George W. Bush’s administration, and plenty of administrations prior. The statement was made prior to protests taking place outside the U.S. Embassy in Cairo. The statement was made in an attempt to ease tensions, anticipating the potential for violence during the protests. The statement was made as an expression of U.S. understanding and decency and is perfectly in line with any effort to impress upon the rest of the world that we are a tolerant nation. No such statement can be, nor should one expect it to be, a novel-length history lesson or treatise on U.S. history, politics, or civics. The statement was issued by the U.S. Embassy in Cairo, a diplomatic mission expressly tasked as a mission to Egypt and Egypt alone: not the U.S. press, not the U.S. itself, not Libya. U.S. embassies are authorized and trusted to issue statements on their own, independent of both the State Department and executive administration stateside. This is not to say they are unaccountable and can do whatever they may please. Foreign service officers and embassy staffers are trusted to understand circumstance and policy and act in accordance with that policy; embassy staff are responsible for knowing U.S. policy and both reflecting and projecting that policy. Nonetheless, given the intent of this particular statement—easing tensions in Cairo and delivering a message to the Egyptian people and press—the statement as issued was entirely reasonable and, in fact, entirely in line with U.S. policy. Given the potential volatility of the situation, the time frame involved, and the overall circumstance, a short statement would really be the only type possible, appropriate, and that stood any chance of making an impression upon its intended audience. With roughly 600 characters of text, the Embassy’s statement condemns those behind this film (and it is becoming increasingly apparent there are some real whackjobs behind it), references Sept. 11, 2001, as an attack upon democracy, reiterates respect of religion as a vital component of American democracy, reaffirms the universal right of free speech, and condemns attempts to abuse said right of free speech for no other purpose than to offend others (which it certainly seems was the sole reason this supposed film apparently exists). The statement is not only intended for protesters or those considering protesting, but the wider Egyptian audience beyond. The statement reflects an awareness that the protesters themselves may likely do whatever it is they plan to do, whether or not any statement has been issued and whether or not police in the area stop them. Egypt is a country of tens of millions of people who carry countless different political beliefs, and the overwhelming majority of the country’s population will not participate or engage in the protests. Far more Egyptians will be made aware of the statement, reading it in local papers and online or hearing it on local television and radio, than participate in the protests. Many of those will emerge from the events of the week appreciating the statement, and in fact disapproving of the behavior of violent protesters. The statement acknowledges an awareness that it will end up “on the record,” reprinted by media and passed on between individuals. As a reasonable, well-spoken message of tolerance, understanding, and respect, it will stand in stark contrast to the violent behavior of protesters or inflammatory language likely to follow. I’m thoroughly convinced that, had circumstances not unfolded during a presidential election year, it would have either been ignored completely or welcomed warmly as a fine expression of U.S. tolerance and decency; it seems those most bothered by the statement are ones hoping to gain domestic political advantage by interpreting it in a way that suits them. The statement was delivered in a country and to an electorate newly experiencing democracy, having newly elected an Islamist president, and having recently experienced many near-continuous years worth of volatile and violent protest, and had to acknowledge an awareness of that. Like it or not, embassy statements are not intended to be forceful, comprehensive, lecturing, or absolute. They are diplomatic, unoffensive, and restrained. Especially when it comes to sensitive issues or volatile situations with uncertain outcomes or uncertain circumstances, statements should be limited in what they say and what they cover, and how. They are often meant to buy time or consideration until more comprehensive or deliberate statements can come from the State Department itself or the administration. If you find fault with the statement, get over it. Such statements can never, will never, and are not designed to ever, appease any and everyone. They are issued with limitations and restrictions and within a particular context; they come amid particular circumstances, with an intent to address particular circumstances. They are composed and issued by individuals who do not formulate policy, but rather implement policy. Countless such statements get issued each year by various diplomatic missions, and you’ve lived your life entirely unaware either because no one has gone out of their way to bother you about them, or the statements proved themselves entirely effective. I have to take exception to Brian Dunlap’s answer. I, too, have worked for the U.S. Embassy in Cairo, as well as holding the job of counselor for public affairs at the U.S. Embassy in Riyadh, Saudi Arabia. The press statement at issue was released, if not written, by my professional counterpart. In other words, I know what position he was in; I understand both the job and the pressures of working in a high-threat environment. Leave aside for the moment that the press release was sent out after instructions to not do so. That in itself should suggest that there were problems with it. It should be a career-killing move. My problem is that as a commissioned foreign service officer, the PAO (public affairs officer) swore the same oath I did to “support and defend the Constitution.” The whole Constitution, at all times. As foreign service officers, we are charged with representing our country, its government, and its people. All of its people, even the stupid ones, the misguided ones, the malicious ones, at least if they are acting within the law. By not pointing out in the press release that freedom of speech, guaranteed to Americans under the First Amendment to the Constitution, protects even idiots like the filmmaker, the PAO did not do his job. By suggesting government condemnation of the film, he gave the impression that the U.S. government has some role in controlling speech. It most decidedly does not. The promotion of freedom of speech is one of the major efforts of the U.S. government and especially of the various offices of public diplomacy. It’s a hard concept for some to understand, that people are free to say stupid, even insulting things. But we protect those people’s right to be idiots because we want to support those who say smart things, even if they might offend others. In the United States, there is simply no right to not be offended. Why is that? Well, a good place to start is that no one can categorically know what will offend another. I hear things that offend me everyday. Some of it might be personally insulting; some of it might insult my intelligence; some of it might be because a speaker is on his hobby horse that bores me to tears. Should I be able to call down the force of government to stop those who offend me with their misinformed opinions? We can take a good guess that saying nasty things about their religion is going to annoy people. But so what? I have a hard time finding any religion that does not think poorly of other religions. Practically every holy book strikes out at one or another religion. Whose religion gets the protection? Why that one instead of this one? Is it only because one religion has a majority following in a certain place? If that is the rule, what happens if a society changes? We have recourse to offensive speech: counter speech. Under some circumstances, we might even have recourse to courts of law. We do not have legal recourse to violence. Sometimes it’s hard to acknowledge that one’s life may be threatened by the actions of some moron— our moron or his moron. But our oaths of office do not permit us to protect only those with whom we agree or think smart or think “right.” Half the population of the world is below average intelligence, after all. Why don’t Americans riot and burn cars, etc. in the United States when Christianity is attacked? What is it like to be a U.S. Foreign Service Officer? Globally, are the Cairo, Libya, and Yemen attacks seen as evidence of American weakness and declining power?